How to Date Your Dragon popped on my recommendations for some reason and I was intrigued by the title just enough to click on it to learn more. While I’m still a tad baffled as to why a M/F paranormal romance would show up in the recommendations for a customer whose audiobook library is largely comprised of M/M romances… oh wait, strike that, I think I know why – I purchased the audio upgrade on a M/F paranormal romance for my sister last week. Still, it’s an oddity but one I’m glad happened because this was an absolute delight and it had me hooked after listening to less than four minutes of the sample. In the world Molly Harper has created, supernaturals, or majicks*** as the locals in Mystic Bayou call them, live among humans without the bulk of humanity being aware of their presence. But as technology advances, it’s only a matter of time before their secret is out and the world at large learns of their existence. In an effort to be proactive, the League for Interspecies Cooperation sends Jillian to Mystic Bayou to learn how the small town filled with a variety of shifters live peacefully alongside humans who know of their existence. While this was not the assignment Jillian had prepared for, her mentor’s indiscretion (which is hilarious, and I hope no one ruins it for you) meant her plans changed at the last minute and she’s woefully unprepared for a field study of this magnitude… on her first time in the field on her own… especially when faced with the less than welcoming town sheriff. As Jillian attempts to navigate the bayou and its residents, trying to collect information for the study without offending the various shifter species and other supernatural residents’ customs, all while avoiding the grumpy sheriff who makes her blood boil in more ways than one, we not only get the story from her perspective, but from Sheriff Bael’s as well. And it makes for an entertaining listen, especially when things heat up between Jillian and Bael and when a serial killer makes his presence known. While I may have figured out why the victims were chosen early on, I never suspected the bad guy was who it was. Nope, I was just as surprised as Jillian was when that played out. But just when I thought all the surprises had been revealed, Harper showed that she had more in store for Jillian, Bael, and the residents of Mystic Bayou and I cannot wait to return to the sleepy little town. Not only was this my first book by the author, but it’s also the first time I’ve ever listened to either narrator. 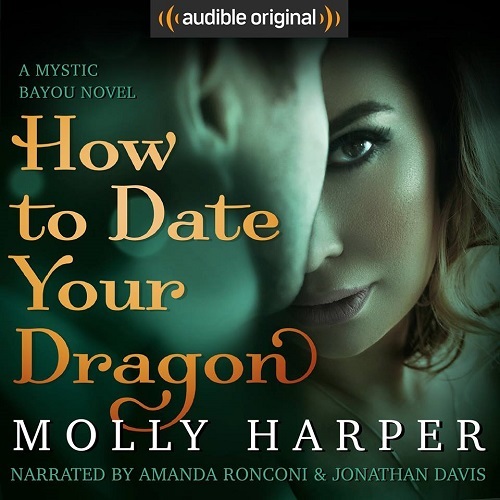 I believe that How to Date Your Dragon is only my second (maybe third), dual narration audiobook and I think the story lends itself well to the format. That both Amanda Ronconi and Jonathan Davis did a wonderful job of bringing Jillian and Bael to life meant that I enjoyed their performances immensely. I loved how Ronconi infused Jillian with snark and sass, friendliness and vulnerability so effortlessly that she felt real to me, like someone I’d be friends with. Davis did equally well at making our grumpy and bossy sheriff seem real, and that added layer of insecurity on behalf of his dragon when Jillian doesn’t respond to his overtures as expected was perfect. These two narrators kept me so entertained that I couldn’t wait to press play whenever I had a few free minutes to listen because I had to know what else Harper had in store for Jillian, Bael, and Mystic Bayou. I really, really hope that the wait for book two won’t be too long because I’m already dying to catch up with everybody. How to Date Your Dragon is one of the Romance Package titles that will eventually make it into my permanent library, I enjoyed it that much. ***Sorry about the possible misspelling. It sounds like they’re saying Mah-jeeks and with the French Cajun accents, I don’t know if I’m even close. I’m the author of almost thirty novels and novellas through Pocket Books, most of them involving vampires and werewolves. My first book, Nice Girls Don’t Have Fangs, came out in 2009. My most recent title, Peachy Flipping Keen was released in April 2018. Most of my titles are available in print, as e-books and audio books at all major book retailers. Some are available exclusively in audio and book. I’m represented by Natanya Wheeler of the Nancy Yost Literary Agency. I recently announced the addition of two new titles to my popular Half-Moon Hollow series (Pocket Books) and a new contemporary romance series, currently called the Southern Eclectic series, also to Pocket Books. And Audible is releasing an exclusive series, the Mystic Bayou series, in January 2018. Amanda Ronconi is an actress and narrator who divides her time between New York City and upstate New York. She has a BFA from NYU, where she studied at the Stella Adler Conservatory. She has performed in theaters around New York City and regionally at the Alley, Capital Rep, and many productions at the Shakespeare Theatre of New Jersey. Her Off-Broadway solo comedy, Shirley at the Tropicana, received critical acclaim and was subsequently featured in the New York Times. Film and TV credits include Daydream Believer (Slamdance 2001's Best Dramatic Feature winner), The Understudy, Deadly Sins (ID Discovery), and IFC's Get Hit and Chasing Paradise. National network and regional commercials include Chase Bank, Sony, and Blue Cross/Blue Shield. Her voice-over work encompasses nearly 100 audiobooks available on audible.com. She is a member of SAG-AFTRA and Actors' Equity. Jonathan Davis, a three-time recipient and fourteen-time nominee of the Audie Award, has earned accolades for his narration from the New York Times, Publishers Weekly, the American Library Association, Booklist, the Audio Publishers Association, AudioFile magazine, and USA Today. He has narrated a variety of bestsellers and award-winners for top publishing houses and national audio divisions, including Penguin Random House Audio, Harper Audio, Hachette Audio, Recorded Books, Blackstone Audio, Macmillan Audio, Simon & Schuster Audio, and Audible, Inc. He has narrated over forty titles of the Star Wars franchise for Lucasfilm Ltd./PRH Audio, including several iconic movie tie-ins, has participated with Star Wars Celebration, and has built a significant fan base. Jonathan's work as a narrator includes films and programming for National Geographic Television, NOVA, PBS, VH1, and Francis Ford Coppola. Jonathan was recently inducted into the Audible Narrator Hall of Fame. Angela utilized her Romance Package subscription to access the audiobook copy of How to Date Your Dragon (Mystic Bayou #1) by Molly Harper, narrated by Amanda Ronconi & Jonathan Davis to listen to and review for this post.